"Deep garnet hue with bright fruit aromas of blackberry, cherry, and mulberry with toasted almond, coffee and cedar. Fresh summer berries on the palate with nutmeg, mushroom and earthy loam. A fresh and lively palate with fine tannins that build in the mouth with a long, vibrant finish. Bendigo in a cool season shows incredible energy with a powerful core. Bold and bright, this wine is intricately layered with chiseled beauty and incredible detail. Lively and inviting in its youth, this wine will also go the distance and is well worth cellaring!" "Intense garnet hue with aromas of boysenberry, blackberry, mulberry, almond, and vanilla. Richly concentrated on the palate with creamy fine tannins that build in the mouth and are lifted by enticing acidity. Lifted fresh berry flavours with a savoury undertone and incredible vibrance that marries beautifully with its prominent frame. This is an "athletic wine" with chiselled beauty that shows incredible detail and beautiful layers. Fresh and inviting in its youth, the underlying structure will also reward cellaring." "Distinctive aromas of violets, boysenberry and blackberry with subtle notes of coconut and mushrooms. Densely concentrated and rich on the palate. The precision of the acidity and power of the tannins create a harmonious, full-bodied Pinot." 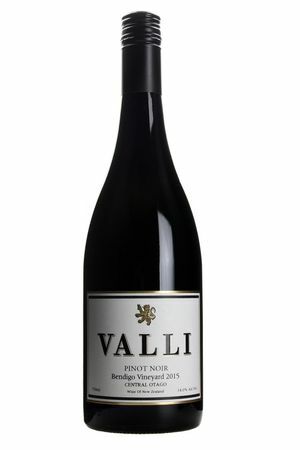 "The Bendigo Pinot Noir is the newest addition to the Valli stable of Single Vineyard Pinot Noirs. Years ago, Grant was involved in the largest-to-date plantings at Bendigo, across 5 different sites. During this time, he identified "Chinaman's Terrace" as his favourite. When the opportunity to make wine from the Zebra Vineyard on Chinaman's Terrace presented itself there was only one answer: YES. The wines from this very warm part of Otago have been described as "big friendly beasts". They are dark, rich, lush wines capturing the rock reflected heat and ripeness of this special site."